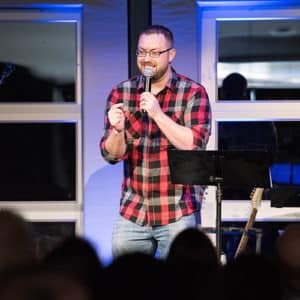 Our Lead Pastor is Pastor Reagan Wagoner. He and his wife, Heather, have lived in Springboro, OH since 2015. They moved to Springboro from Nashville, TN after living there for 12 years, but Heather grew up nearby in Germantown, OH. They have been married for 14 years and have four children (Reese – 11; Ty – 8; Tess – 7; Presley- 3). Pastor Reagan has been serving in ministry for 19 years and has received two pastoral degrees in Biblical Studies/Psychology and a Master of Divinity (MDiv) in Pastoral Studies. In his 19 years of ministry, he has been personally involved in the planting of 34 churches through mission partnership, training, or direct planting both here in the Cincinnati/Dayton area, the US, and also around the globe. In October 2014, God began to move in the heart of Pastor Reagan and his wife, Heather, to start a church in the Cincinnati/Dayton area. 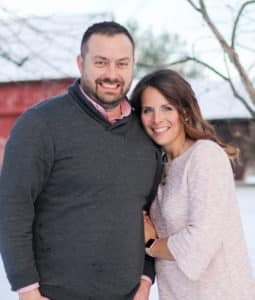 After much prayer, Pastor Reagan decided to pursue starting a brand new family-friendly church in Springboro, Ohio, along with Pastor Rich & Amanda Hailey, from Thompson’s Station, TN. Grace Point’s first meeting was in April 2015. In August 2015, the church began to meet in the home of the Wagoner’s. Because of the growing number of kids and adults in attendance, Grace Point quickly decided to begin meeting at Dennis Elementary in September of 2015. Grace Point moved to its current location off of the Springboro/Franklin exit in December 2018, moving to two services at 9:30 and 11am! At Grace Point Fellowship, we believe that God is FOR us, not against us! We want you to know the true and biblical Jesus. Church is not about religion, but about an authentic relationship with God. I pray for everyone that I come in contact within the church and outside the church that they would know that God desires to be close to us, not distant. I have a desire in our day and time to see more people wake up out of the average American church culture of consumerism (church is just about what I get), humanism (church is all about me), and institutionalism (church is just about programs and rituals), and realize that God has a tremendous purpose for their life (Jeremiah 29:11)! At Grace Point, we seek to raise up and send out into the world passionate servants of Jesus Christ, that His name, not ours, may be great (Matt. 28:19-20)! FOR JESUS. We believe that God is for Jesus and is Jesus and that He is for the world, for community, and for family. Because we are people who are for Jesus, we will also be for each of these elements in the following ways. FOR THE WORLD. We work to make a difference globally by showing the grace of Jesus using an Acts 1:8 approach of sharing His grace locally, nationally, cross-culturally, and to the ends of the earth. FOR COMMUNITY. We are involved in building community and believe what we do for God in our homes, in our schools, on our teams, and in our workplaces is even more important than what we do on Sundays. We are a church that desires to be for the community, and not against it or separate from it. FOR FAMILY. We encourage families and the next generation of kids growing up around us and in our homes to love Jesus and love each other. We believe that a healthy and functioning family is the most important influence we have if we desire to positively impact the community and the world for Christ! God didn’t call us to plant a church. He called us to reach a city. The church is merely the platform to engage the city. Trust in the Lord with all your heart, and lean not to your own understanding. In all your ways acknowledge Him, and He will direct your paths.